Dr. Greenson received his undergraduate and medical degrees from the University of Michigan. He did his residency training in pathology at Cedars-Sinai Medical Center in Los Angeles and completed a 2-year fellowship in gastrointestinal pathology at Johns Hopkins under the mentorship of John Yardley, M.D. After working as an assistant professor of pathology for 3 years at Ohio State University, Dr. Greenson returned to the University of Michigan where he is currently a professor of pathology and the director of GI and hepatic pathology. Dr. Greenson is a past president of the Gastrointestinal Pathology Society and has been on the education committee of both the USCAP and the ASCP. He has also been a member of council. 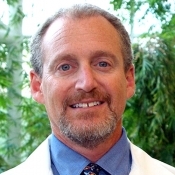 Dr. Greenson is one of the editors of Sternberg’s Diagnostic Surgical Pathology and he has co-authored and edited two textbooks on Gastrointestinal pathology (Diagnostic Pathology Gastrointestinal – Amirsys, Morson and Dawson’s Gastrointestinal Pathology-Wiley-Blackwell). He serves on the editorial boards of the American Journal of Surgical Pathology, Histopathology and Human pathology and has authored over 160 peer-reviewed publications.